This article is about the Forerunner structure. For other uses, see Library (disambiguation). The Library of Installation 05. 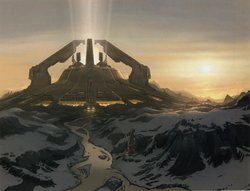 The Library, known to the Covenant as the Repository of Fate, is the name given to a structure present on the installations of the Halo Array. The Libraries are vast archive complexes and research facilities, housing the collated genetic information of numerous sentient species indexed by the Lifeworkers during the Conservation Measure, an effort to re-seed life in the galaxy following the activation of the Halo Array. The structure also houses the Activation Index, the object used to activate the Halo ring and simultaneously initiate the repopulation process of the species archived in the Library. Library facilities are not exclusive to the Halos and are found on several other installations as well. Located at the heart of the Library is a multi-tiered hall known as the Index chamber, in the center of which the Activation Index is suspended. In accordance with proper Flood containment procedures, the Reclaimer tasked with activating the Installation must first deactivate an energy field surrounding the Index by accessing a large elevator on the Library's uppermost floor. The elevator then descends from the highest level of the Library to the Index's position, allowing the Reclaimer to retrieve it from its container. Also according to procedure, the Reclaimer's passage through the Library is assisted by the Installation's monitor, whose duties also include opening the facility's various security doors. The interior of a Library consists of multiple gigantic hallways of geometric design interconnected to one another, all surrounding the Index chamber. Massive security doors are located between each section. Other floors of the structure are accessed via large, circular elevator platforms. Like most structures on the Halo rings, a Library also houses a network of ducts and shafts used by the Sentinels or the installation's monitor to access other areas. During the Flood outbreaks on Installation 04 and Installation 05, the Flood were able to utilize these tunnels to move across the structure. Due to its crucial importance, the Library is the first target of the Flood parasite during an outbreak. As a security measure against the Flood, most Libraries are separated from the rest of the installation by various types of obstacles, such as moats, chasms or massive walls. Access to the Library itself usually occurs via each installation's internal teleportation grid. On Installation 05, 2401 Penitent Tangent was unable to assist the individuals wishing to retrieve the Index in this manner. As a result a longer, less direct route had to be taken. An anti-gravity gondola spanned a large chasm separating the installation's quarantine zone from the Library. The quarantine zone was encircled by the Sentinel Wall, a massive barrier which was protected by a containment shield and filled with numerous Aggressor Sentinels and Enforcers. On both Installation 04 and Installation 05, the Flood was still able to breach such defenses and infest the Library. The fourth floor inside Alpha Halo's Library. After meeting John-117 in the swamps near Installation 04's Flood containment facility and deeming him to be a Reclaimer, 343 Guilty Spark translocated the Spartan into the Library of Installation 04 and instructed him to retrieve the Index. The Flood had heavily infested this Library in the few short days since their initial breakout, with large groups using the ventilation shafts and access corridors to make their way through the facility. There were Flood in almost every part of the complex, including the Index chamber itself, and the Sentinel drones assigned to the facility were mostly overwhelmed. By the time the Chief arrived, the Sentinels were reduced to small groups using the shafts to avoid destruction and the Flood had begun spreading their spores through the facility by using the ducts. It seems the Covenant made no attempt to access the Library on Installation 04. While the Master Chief explored the dark bowels of the structure, there was no sign of the usual crates, stationary shield generators or spare weapons. As the Spartan progressed through the Library, 343 Guilty Spark remarked upon both the nature of the Flood and the Forerunners. Making a specific reference to their technological superiority, he wondered why the Chief had brought "such ineffective weapons to combat the Flood". Guilty Spark also recommended that the Master Chief should upgrade from his Mark V MJOLNIR armor, which according to a Forerunner ranking system was only Class 2 to a Class 12 combat skin, which was stated as a necessity in order to combat the Flood. However, he later told the Master Chief that his suit would serve him well as the Flood began to contaminate the ring's atmosphere with Flood spores. Toward the end of this Library, the Chief encountered the body of Staff Sergeant Marvin Mobuto, a Marine who Guilty Spark had previously approached and brought to the Library in order to retrieve the Index and activate the ring. With help from the Sentinels, and motivation from Staff Sergeant Mobuto, the Master Chief fought his way through three levels of the complex and successfully retrieved the Index. Installation 05's Library and its surroundings. While the Master Chief hunted down the Prophet of Regret during the Battle of Installation 05, Commander Miranda Keyes, Sergeant Johnson and most of UNSC In Amber Clad's Marines attempted to break into the Library of Installation 05 in order to find and retrieve the Index. Due to the significantly larger Flood outbreak on this Installation, the Library and its defenses were seriously damaged and as a consequence were filled with a larger number of Flood than its Installation 04 counterpart. The UNSC forces were seemingly unprepared for the Flood presence, and many of them were infected by the Flood. Around the same time, the recently-appointed Arbiter Thel 'Vadam traveled to the Library on a mission to retrieve what the Covenant referred to as the "Sacred Icon". Dropped into the exterior side of the Sentinel wall from Tartarus' Phantom, the Arbiter battled his way through swathes of Flood and Sentinels to find the anti-gravity gondola that would carry him to the other side. By removing the containment plugs, he then lowered the containment shield guarding the Quarantine Zone, enabling him to enter the Library proper. Unfortunately, this also allowed the Flood to spread further, adding to the magnitude of the outbreak. After traversing through the quarantine zone, both the UNSC forces and the Arbiter used gondolas to enter the Library's inner section, with the humans making it first. The inner section of the Library was largely identical to Installation 04's, though significantly more brightly lit than the dim interior of Alpha Halo's Library. Sometime prior, the elevator in the central shaft had descended to the bottom level, but the energy field allowing one to walk over the shaft and retrieve the Index was not active. This forced Commander Keyes to use an inert Flood tentacle to reach out and retrieve the Index, nearly falling to her death in the process if not for Sergeant Johnson's aid. After making it into the Index chamber, the Arbiter engaged the humans, knocking Johnson unconscious. It was then that Tartarus and his Jiralhanae forces arrived and took the humans prisoner, also removing the Index from Keyes' possession. Tartarus then betrayed the Arbiter, pushing him into the central shaft of the Library using the Fist of Rukt. After being thrown to his death by Tartarus, the Arbiter was rescued by the Gravemind, who existed beneath the bottom level of the Library. Library-type structures are found on some Forerunner constructs other than the Halo Array, although their purpose and function on these constructs may differ. Cortana's simulated retelling of the history of the Forerunners[note 1] depicted a structure closely resembling a Library, surrounded by a massive wall and several docking towers housing Forerunner dreadnoughts ready for launch. The foremost structure of the Library is similar to the symbols on the stone slabs on the top floor of the bases in the Halo: Combat Evolved map Blood Gulch. It could mean that the structure of the Library is somehow related to Blood Gulch, or that it is purely a common Forerunner symbol. In the Halo 2 multiplayer level, Containment, if one flies a Banshee, in the distance Installation 05's Library can be seen. Concept art of Installation 05's Library for Halo 2: Anniversary. John-117 and 343 Guilty Spark about to obtain the Index in Alpha Halo's Library. The Library of Installation 05 from Halo 2. A Forerunner Library on an unspecified world. ↑ According to Frank O'Connor, the visuals in Origins may not be entirely accurate or factual, as they are pieced together from Cortana's incomplete store of information. ↑ Halo: Combat Evolved Anniversary - Library, "Activation Index"